5.6% of the population is Asian American; 3.2% Middle Eastern; 17% various Hispanic and Latino ethnicities. That’s about 81 million people of non-European descent--what we are calling ethnic--representing a market size of $65 - $100 billion annually in the US. Ethnic food is important to these ethnic communities. Even though people of various backgrounds are taking food out or eating in restaurants from time-to-time, they still enjoy the comfort of cooking the foods they grew up eating at home. But ethnic grocery stores are few and far between, making ethnic food inaccessible and hard to procure for many customers. The market is being ignored by the big players in both the grocery store and grocery delivery spaces. For the ethnic community, ethnic food is more than just food. It is not just comfort food, or a connection to home, but also part of an identity. With Fretch, you can have access to the foods that make you who you are. Fretch is proud to offer an easy and convenient online experience to customers placing orders. With a friendly, empathetic, and responsive customer service team that understands the cultural nuances and is prompt in responding to orders and delivery issues. Our customers are spreading the word about Fretch. Because we are bootstrapped, all our growth has come organically through word of mouth and user recommendations. 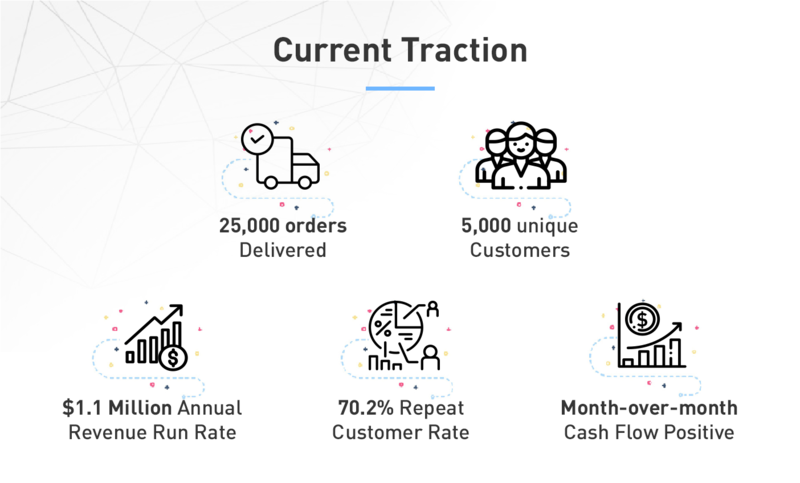 We have delivered over 25,000 orders to 5,000 unique customers and are currently operating at a $1.1 million annual revenue run rate. Although grocery is considered a ‘volume business’ as economies of scale come into play, we have had a laser focus on profitability since day one, and as a result we are currently month-over-month cash flow positive. We’ve experienced positive quarter-over-quarter growth since 2015 and are on track for substantial growth in 2019. We treat them how we’d treat our family, our moms, and our grandmas--with love and respect. They are our Fretch Family. We have over 5,000 unique customers. 1,378 of them have placed at least 5 orders with us, and 183 of them have placed at least 25 orders! 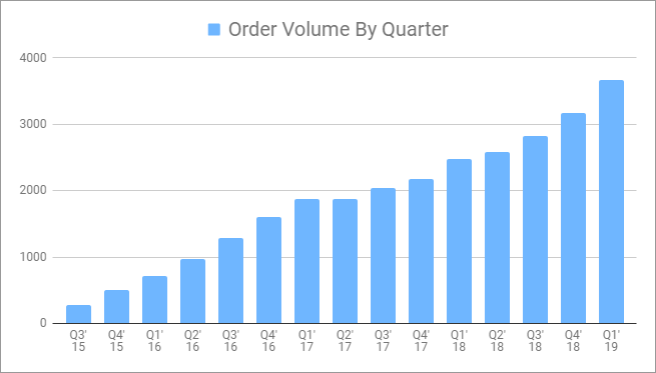 When a customer places an order with Fretch for the first time, there is an over 70% chance s/he will place another order with us, without any present marketing effort! 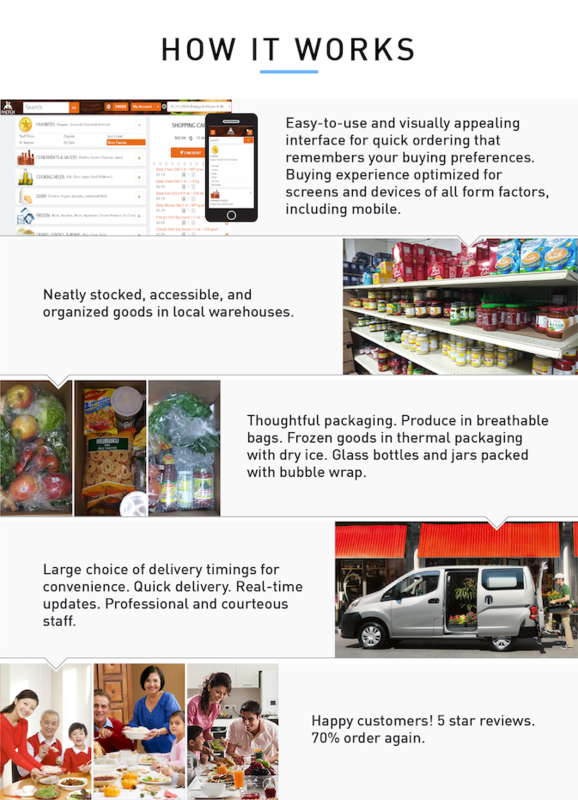 We are in the business of delivering ethnic groceries to ethnic communities in major metropolitan areas like New York, and we are committed to making Fretch the go-to grocery delivery service for such communities through a unique combination of speed, convenience, variety, savings, transparency and an overall superior shopping experience. Our current cost of acquisition of a customer is $10.50 and the average order size in $80. The current lifetime value of our customers is $225 (on gross profit over a one year time period). Maintain a reasonable markup on everything else. Our markups are slightly higher, but still very reasonable, on other items like snacks and frozen entrees. We will minimize costs by leveraging shared warehousing and delivery infrastructure as multiple ethnicities are added to same locations. We will perfect the business and distribution in one location, focusing on one ethnicity. And then we will replicate the model along with the systems and processes to other ethnicities and locations. Total retail and food services sales in the U.S. in 2017 were around $5.5 trillion, and grocery store sales specifically totaled $641 billion. Assuming 50% interest and utilization, the ethnic grocery market size can be estimated to be about 10-15% of the U.S. grocery store sales ($641 B) or about $65 billion-$100 billion annually in the US. Our primary competitors are Amazon Fresh, Freshdirect, Peapod, and other ethnic retail outlets. But our sheer variety of offerings within a particular ethnic niche makes us the comprehensive go-to service for the grocery requirements of that ethnic group. Most ethnic community-specific retail outlets, on the other hand, do not have a nimble, local delivery system in place and are severely limited in reach. We’re really out on our own when it comes to offering online orders and delivery in the ethnic grocery space. 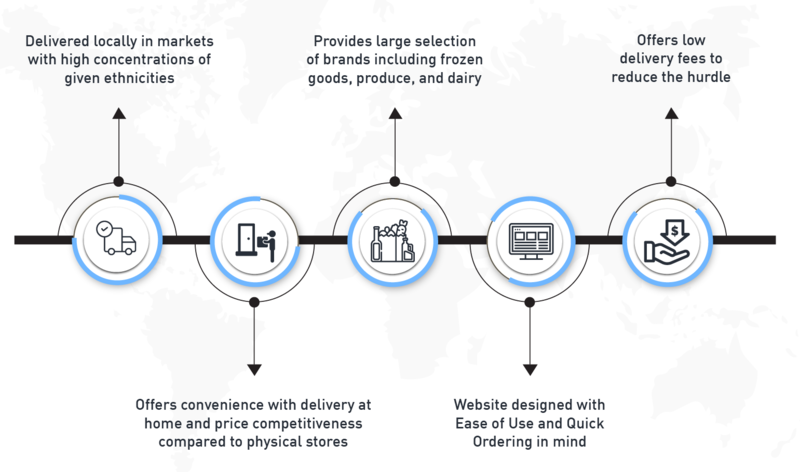 Furthermore, our consistent focus on maintaining high product quality, packaging, and a world-class customer experience, coupled with investments in setting up business and technology processes to enable a seamless loop of orders, fulfillment and feedback puts us in a very serious position to capture a big piece of this lucrative pie. Fretch started with the Founder’s personal funds and savings of about $200K. Loans were taken from friends and family along the way that have now been completely paid off. We 100% bootstrapped, and are now profitable with a healthy growth trend. That said, we want to expand faster, and spend more on growth, technology and marketing, for which we’re looking for funding that will further fuel our next growth spurt (see roadmap below). We are in talks with a few high profile angel investors, but primarily, it’s all right here at Republic. Within the last year, our focus has been to perfect our business model and the internal processes, and most importantly, to establish profitability within the model. 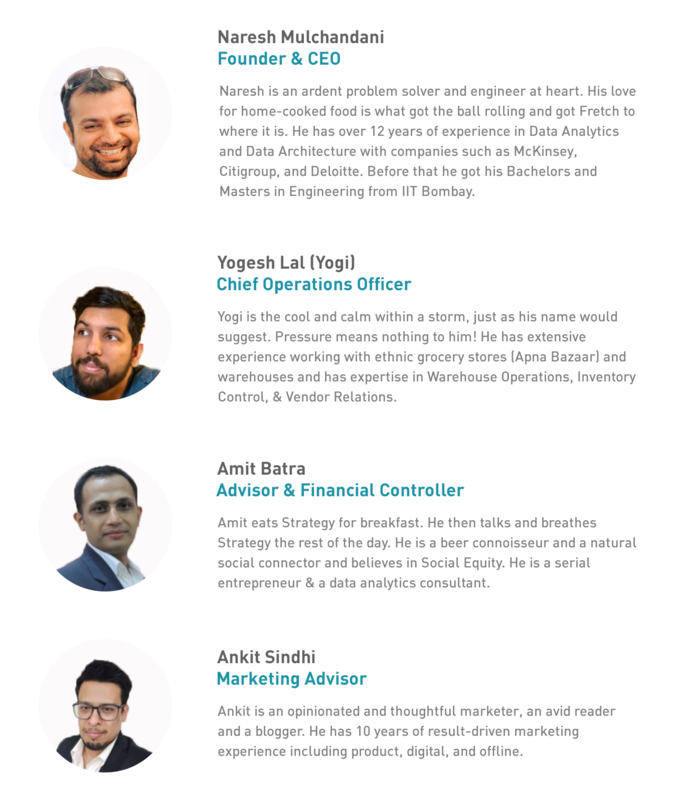 Having achieved sustained profitability and established benchmarks for various internal processes from inventory management to staff management to product quality management, we are now at a point where we are primed to grow exponentially. The business model, the processes, and the financial numbers can support this growth. Our focus now is to invest in user acquisition, customer retention, and E-Commerce technology to materialize the growth. We envision the next phase of the company to replicate the business model that we have built so far to expand into other ethnicities and geographies within the US. Why we’re the right ones for the job. And most of all, we not only share a love of food, but we also have a deep understanding of the problem experienced personally, and by friends and family. 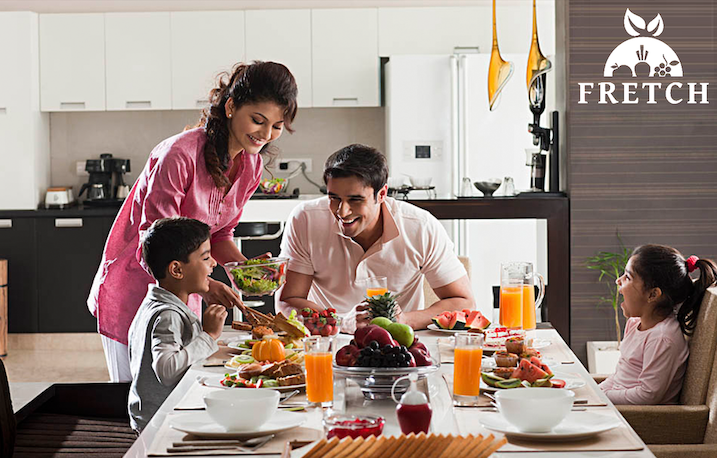 Let’s celebrate the diversity of our great country with one of its most important cultural ingredients - food! Get in on the ground floor while you still can! The smallest investment amount that Fretch is accepting. Fretch needs to reach their minimum funding goal before the deadline. If they don’t, all investments will be refunded. If a trigger event for Fretch occurs, the discount provision gives investors equity shares (or equal value in cash) at a reduced price. Fretch needs to raise $25K before the deadline. The maximum amount Fretch is willing to raise is $1.07M. 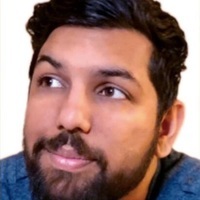 Naresh: Hi, my name is Naresh. Naresh: We run a company called Fretch. When we moved to Manhattan in New York, we realized that getting our groceries was an absolute chore. Unlike regular mainstream groceries, ethnic grocery stores are few and far in between. It was a long trip back and forth and it's harder to procure and which is why it you know something that kind of affected us or bothered us. Yogi: The passion that he had behind Fretch is what drew me closer and wanted me to go ahead and be part of Fretch and just grow and expand. Naresh: It's a common problem that we set out to solve. A problem that we've seen in many other families throughout in Manhattan, New York and I'm sure many other places as well. Fetch and fresh. We fetch fresh groceries for you. Naresh: Sure, my name is Naresh. 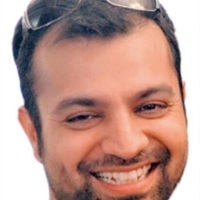 Naresh: We run a company called Fretch out in New York. Fretch focuses on ethnic groceries depending on which ethnicity you look at, it's about 10% to 15% of the US population, so you could estimate the overall market size to be between 65 and 100 billion dollars annually. Yogi: Grocery delivery has really become such a hot market, so it's attracting a lot of new businesses and a lot of new ideas but despite all this, we feel that ethnic communities are being overlooked and underserved. It's so hard to get ethnic groceries. Naresh: For example, when I moved to Manhattan, New York, my wife and I would have to take a 45 minute trip one way to get our groceries. It was an absolute chore and there were no delivery options, so it basically started from my personal pain point, that we started Fretch and we knew at least 10 other south Asian families who had the same exact problem and that's how Fretch started. It started from the back of my car to now where we are which is at 20,000 orders delivered, were at a one million dollar revenue run rate annually. We've been incessant about our quality, about customer service, about the overall customer experience, that we feel that now our product is mature and there are customers absolutely love us for it. Tim Draper: I don't quite get why this is going to be better than Uber eats or DoorDash. Do we need another delivery service? Naresh: Are there any of them that focus on ethnic? Tim Draper: No, they don't focus but you can certainly get it. Naresh: The way they make money is by buying from retail at retail prices and the way they make money is by adding a mark-up on top of the retail price. They're paying you know a higher price on basic groceries. We don't do that. We have a set up where we buy directly from distributors. We have savings and we pass the saving onto the customer. You might have an aisle you know in a big supermarket but the basics and the staples you still have to go to an ethnic store. Yogi: What they mainly do is their whole job is just to pick up and deliver. They don't understand the backdrop and the importance of ethnic groceries. Now, in Indian there's like 20 different brands of rice, so to get that service we offer all that. That's something that Amazon Fresh doesn't offer, Walmart doesn't offer. We're not just a delivery company, we're a customer service company. That's our main focus. Anousheh Ansari: What is special about your customer service? Naresh: We are very responsive. We give a no questions asked refund policy. People love us for it. Not just in terms of how we respond or how we deal with customers but we treat them like family. Yogi: Lot of these customers give us feedback that we actually use and use their input to grow. We're like hey we should try this, we should try this, hey, why not try this and we take all that into account and to establish where we are now. Bill Draper: On the million dollars of revenue, are you profitable? Tim Draper: You know Anousheh spent a 11 days on the space station and I'm wondering if you have had any deliveries up there currently they are very short of fresh food. Tim Draper: Are you only delivering in New York? Naresh: Only in New York right now. Polly Draper: Who are your customers? 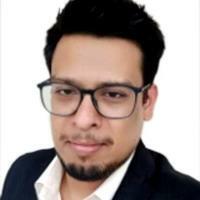 Naresh: We started with only south Asian but the plan is to include other ethnicities also on the platform, so we intend to use whatever we've learnt and experienced so far and basically leveraging existing infrastructure. Polly Draper: It seems like you are you have the easiest time procuring this stuff because there is so many ethnicities who are also close together you get stuff from Chinatown or you go up it's not as if it would be as hard in New York as it would be somewhere else. Naresh: It is absolutely. Even here we understand the problem and the solution immediately. No one's really doing it. Tim Draper: I'm still concerned about competition, so there is Instacart or Goodeggs I believe that they are buying wholesale and then bringing them in. I don't think they are going out to the big supermarkets, so the ethnic thing could just be a feature. Naresh: They are trying to compete with you know the Walmart's and Amazons of the world but the ethnic population as I mentioned is about 10 to 15% of the US population. Tim Draper: What does this look like in 10 years? Naresh: The dynamics going to be that we have set up in major metro areas, be it you know The Bay Area, be it New York, be it Chicago. You have big chunks of ethnic populations in all of these, so right now we're in New York. There is a big Greek population out in Astoria and Long Island city and so that's our next target that we are trying to go for. Yogi: We perfected our infrastructure for South Asian groceries. Now the only thing that needs to be changed is to add other ethnicities and expand from there, so we are scalable within the next couple of years. Anousheh Ansari: Do you ship or do you deliver? Anousheh Ansari: So, you actually, physically someone ... You actually maintain a fleet for delivery or you contract with like an Uber? Naresh: We contract with a delivery company and they provide drivers as and when they're needed, as many as we need. Anousheh Ansari: If I order in the morning you deliver it in the afternoon? Naresh: Same day yeah we can deliver it same day? Tim Draper: What are your backgrounds? Naresh: My background is more of corporate. I've worked for companies like Deloitte and McKenzie and City group and that really wasn't my calling, so about four years ago is when Fretch started and then so I knew this is where I had to be and this is where I end up. Yogi: Yeah, and I come from a hospitality background. I was managing a hotel and from there I moved on to grocery, locally that serves ethnic grocery so I went onboard and realized the grocery base is huge and this is where I met Naresh as well so he had already started Fretch, he was still new, he was looking to see where to procure some of the distributing goods and that's where I reached out to him and then from there we built connection and a friendship and then from there that turned out into a business partnership. Tim Draper: Terrific. Well, thank you for coming into meet the Drapers. Tim Draper: Good job. Good luck. Alright. Yogi: Appreciate it. Thank you so much. Naresh: I believe everyone did understand the problem that we're trying to solve. Naresh: Yeah, they were getting hungry. On hindsight I think we should have been more clear about the exact roadmap we want to follow about the next steps that we want to get to maybe specified the exact cities we want to get to or the ethnicities that we want to target. Yogi: We need to show everybody not just the South Asian community, the Greek community, the Far-eastern community, everybody in between to say hey, ethnic groceries is something that we need and we needed easily. Tim Draper: Let's see what the judges thought. Judges, what did you think of Fretch? Anousheh Ansari: I think they're addressing a definite need in the market. I like the idea. 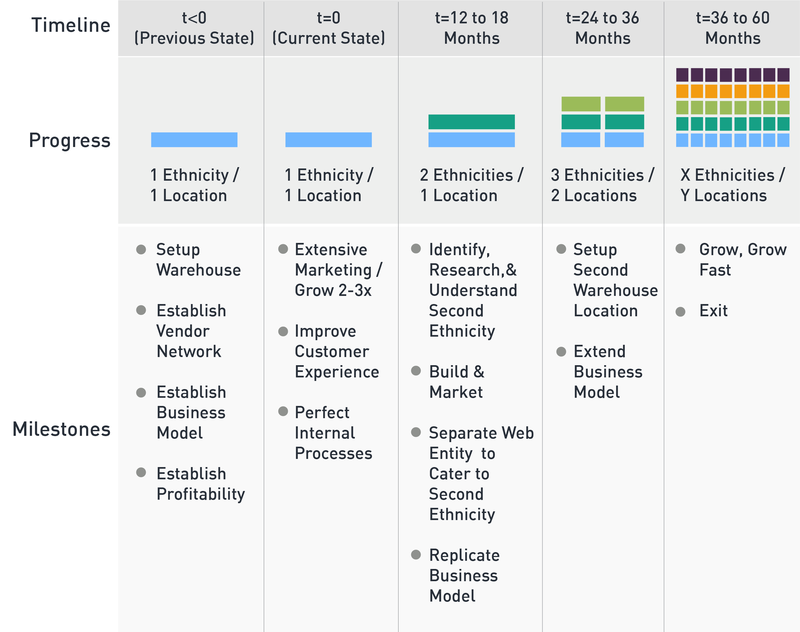 I don't know how scalable it is when they want to go across geography and across ethnicity, how they can scale their model and stay profitable. Anousheh Ansari: They are very hands on everything was like they talk to their customers, there is a lot of personal delivery. Tim Draper: That's a real positive that they are customer oriented are really good. My biggest concern is competition as I mentioned there. Amazon might just take over this business where you are going to get delivery of whatever you want by drones service, to your house. You're going to go, they're really nice guys who delivered that ethnic food to me but here I'm getting my curry you know just like that through Amazon. I'm worried about what the dynamic is later. I do like that they're almost to the point where they are farming the stuff that does add to their margins which is a really smart thing. Bill Draper: I think it would make it but not very big. I don't think it will ever get, as you say, a really good multiple. Tim Draper: But we all know it's an enormous market and it's growing but this maybe a niche part of it and do you think first to go to Fretch or do you think first go to Instacart or something else. Okay and now let's get the vibe. Tim Draper: Okay, do you feel Fretch okay feeling not so Fretch. Okay so for Fretch are we up, down, all around boom. I'm at three quarters. Polly Draper: I'm at half. Tim Draper: I was the most ... oh dad's got a three quarters. Bill Draper: I'm about the same way. Tim Draper: You two are sideways and we were sort of three quarters. Interesting. Polly Draper: That makes what? You are the math guy. That's is one and a half. Tim Draper: It's a total of one up. Now you the viewer can go ahead and decide, thumbs up, thumbs down or you can invest. Bill Draper: Or at least you can order from Fretch. Tim Draper: Or you can order from Fretch. Go ahead you can invest go to meetthedrapers.com and give it a shot. Tim Draper: Stay tuned you are going to see one of these amazing bitcoin blockchain interviews, it's coming up right now. Speaker 16: If you were to design currency today, it would not look like paper. Speaker 17: Live long and blockchain. Speaker 16: Three words fund the revolution. Manufacturing or design defects, unanticipated use of any of the food products or their packaging, as manufactured by third-parties and sold by us, or inadequate disclosure of risks relating to the use of such products or their packaging can lead to injury or other adverse events. These events could lead to recalls or safety alerts relating to such products (either voluntary or required by governmental authorities) and could result, in certain cases, in the removal of concerned product(s) from the market. Any recall could result in significant costs as well as negative publicity that could reduce demand for such products and our services related to their sale. Personal injuries relating to the use of such products can also result in product liability claims, partially or fully, being brought against us. In some circumstances, such adverse events could also cause delays in introducing new products. Reductions in sales of our products will have an adverse effect on our profitability and ability to generate cash to fund our business plan. The following factors, among others, could affect continued market acceptance and profitability of our products: • the introduction of competitive products; • changes in consumer preferences among ethnic food products; • changes in consumer eating and snacking habits, including trends away from certain categories, including major allergen-free, gluten-free and non-GMO products; • changes in awareness of the social effects of farming and food production; • changes in consumer perception about trendy snack products; • changes in consumer perception regarding the healthfulness of our products; • the level and effectiveness of our sales and marketing efforts; • any unfavorable publicity regarding ethnic products or similar products; • any unfavorable publicity regarding our brand; • litigation or threats of litigation with respect to our products; • the price of our products relative to other competing products; • price increases resulting from rising commodity costs; • any changes in government policies and practices related to our products, labeling and markets; • regulatory developments affecting the manufacturing, labeling, marketing or use of our products; • new science or research that disputes the healthfulness of our products; and • adverse decisions or rulings limiting our ability to promote the benefits of popcorn products. Adverse developments with respect to the sale of our products would significantly reduce our net sales and profitability and have a material adverse effect on our ability to maintain profitability and achieve our business plan. We collect and store sensitive data, including intellectual property, our proprietary business information and that of our customers, suppliers and business partners, and personally identifiable information of our customers and employees, in our data centers and on our networks. The secure processing, maintenance and transmission of this information is critical to our operations and business strategy. Despite our security measures, our information technology and infrastructure may be vulnerable to attacks by hackers or breached due to employee error, malfeasance or other disruptions. Any such breach could compromise our networks and the information stored there could be accessed, publicly disclosed, lost or stolen. Any such access, disclosure or other loss of information could result in legal claims or proceedings, liability under laws that protect the privacy of personal information, and regulatory penalties, disrupt our operations and the services we provide to customers, and damage our reputation, and cause a loss of confidence in our products and services, which could adversely affect our business/operating margins, revenues and competitive position. The secure processing, maintenance and transmission of this information is critical to our operations and business strategy, and we devote significant resources to protecting our information by continuously investing in software and business processes reviews and upgrades. The expenses associated with protecting our information/ these steps could reduce our operating margins. The Company is dependent on Naresh Mulchandani and Yogesh Lal in order to conduct its operations and execute its business plan, however, the Company has not purchased any insurance policies with respect to those individuals in the event of their death or disability. Therefore, if any of Naresh Mulchandani and Yogesh Lal die or become disabled, the Company will not receive any compensation to assist with such person’s absence. The loss of such person could negatively affect the Company and its operations. Demography of our clientele is, by nature and as per the core business model, more ethnically skewed than that of other businesses. We are in the business of selling ethnic food products. The demand for such food products is dominated by ethnic communities who are native consumers of these ethnic food products. The demand of our products and services is therefore highly correlated to, and affected, positively or negatively, by immigration trends, demographic shifts, and purchasing capacity of specific ethnicities in the geographical region of our operation. Failure by our transportation providers to deliver our products on time or at all could result in lost sales. We currently rely upon third-party transportation providers for a significant portion of our product shipments. Our utilization of delivery services for shipments is subject to risks, including increases in fuel prices, which would increase our shipping costs, and employee strikes and inclement weather, which may impact the ability of providers to provide delivery services that adequately meet our shipping needs. We may, from time to time, change third-party transportation providers, and we could therefore face logistical difficulties that could adversely affect deliveries. We may not be able to obtain terms as favorable as those we receive from the third-party transportation providers that we currently use or may incur additional costs, which in turn would increase our costs and thereby adversely affect our operating results. Fluctuations in the mix of customer demand for our various types of solution offerings could impact our financial performance and ability to forecast performance. Due to fluctuations in customer needs, changes in customer industries, and general economic conditions, customer demand for the range of our offerings varies from time to time and is not predictable. In addition, our gross margins vary by customer and by segment and the mix of services provided to our customers could impact our results of operations as certain of our customers and segments have different gross margin profiles. Generally, the profitability of an account increases over time. As a result, the mix of solutions we provide to our customers varies at any given time, both within a quarter and from quarter-to-quarter. These variations in service mix impact gross margins and the predictability of gross margins for any period. You should not rely on the results of any one quarter as an indication of our future performance. Our past operating results may not be accurate indicators of future performance, and you should not rely on such results to predict our future performance. Our operating results have fluctuated significantly in the past, and could fluctuate in the future. Factors that may contribute to fluctuations include: * changes in aggregate capital spending, cyclicality and other economic conditions, or domestic and international demand in the industries we serve; * our ability to effectively manage our working capital; * our ability to satisfy consumer demands in a timely and cost-effective manner; * pricing and availability of labor and materials; * our inability to adjust certain fixed costs and expenses for changes in demand; * shifts in geographic concentration of customers, supplies and labor pools; and * seasonal fluctuations in demand and our revenue. Demand for and pricing of our products are subject to economic conditions and other factors present in the various markets where the products are sold. Demand for our products is subject to the level of consumer demand for the e-commerce based sale and delivery of ethnic groceries and produce. The level of new our products and services is cyclical, affected by such factors as general economic conditions, interest rates and availability of credit, consumer confidence, patterns of consumer spending, fuel cost and vehicle replacement cycle. Consumer preferences also impact the demand for our products and services purchases. A decrease in demand due to any of these factors would have a negative effect on our business and operations. Our revenues are generated primarily from servicing customers seeking to hire qualified professionals in the technology, healthcare, and the finance industry. Demand for these professionals tends to be tied to economic and business cycles. Increases in the unemployment rate, specifically in the technology, healthcare, finance and other vertical industries we serve, cyclicality or an extended downturn in the economy could cause our revenues to decline. Therefore, our operating results, business and financial condition could be significantly harmed by an extended economic downturn or future downturns, especially in regions or industries where our operations are heavily concentrated. Further, we may face increased pricing pressures during such periods as customers seek to use lower cost or fee services, which may adversely affect our financial condition and results of operations. As a distributor of food products, our business depends on developing and maintaining close and productive relationships with our vendors. We depend on our vendors to sell us quality products at favorable prices. Many factors outside our control, including, without limitation, raw material shortages, inadequate manufacturing capacity, labor disputes, transportation disruptions or weather conditions, could adversely affect our vendors’ ability to deliver to us quality merchandise at favorable prices in a timely manner. Furthermore, financial or operational difficulties with a particular vendor could cause that vendor to increase the cost of the products or decrease the quality of the products we purchase from it. Vendor consolidation could also limit the number of suppliers from which we may purchase products and could materially affect the prices we pay for these products. We would suffer an adverse impact if our vendors limit or cancel the return privileges that currently protect us from inventory obsolescence. If, for any reason, our brand or reputation is damaged, the attractive characteristics that we offer may diminish, which could diminish the value of our business. We are currently an attractive brand for our customers because our products are high quality and generate a high level of sales at a premium margin relative to their shelf space. This is due to both our premium price point and our sales velocity. If our brand or reputation is damaged for any reason, consumers may no longer be willing to pay a premium price for our products and we may no longer be able to generate a high sales velocity at our then-current prices. If we no longer offer these characteristics, our customers may decrease their orders of our products, which could have an adverse effect on our business and results of operations. 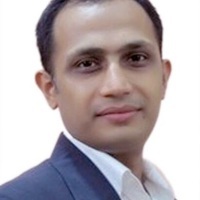 In particular, the Company is dependent on Naresh Mulchandani and Yogesh Lal who are CEO, 12/02/2014, Current and COO, 05/18/2017, Current of the Company. The Company has or intends to enter into employment agreements with Naresh Mulchandani and Yogesh Lal although there can be no assurance that it will do so or that they will continue to be employed by the Company for a particular period of time. The loss of Naresh Mulchandani and Yogesh Lal or any member of the board of directors or executive officer could harm the Company’s business, financial condition, cash flow and results of operations. Please see the section of this Memorandum entitled "Transactions with Related Persons and Conflicts of Interest" for further details. We are dependent on third-party suppliers for key raw materials, packaging materials and production inputs, and our use of natural ingredients exposes us to weather and crop reliability. We purchase the raw materials used in the brewing of our beers, including barley, hops, malt, and other ingredients, and the distilling of our spirits from a number of domestic and foreign third-party suppliers. The demand for hops grown in the United States has increased due to the success and growth of craft brewers and the popularity of beer styles that include hops grown in the United States. Certain U.S. hops are in limited supply and prices have risen for both spot purchases and forward contract pricing, accordingly. The beer industry has faced hops shortages in the past, during which times other beer companies with greater financial resources than us purchased large quantities of hops, and our industry could face shortages again in the future. In addition, hops and malt are agricultural products and therefore many outside factors, including weather conditions, farmers rotating out of hops or barley to other crops, pests, government regulations and legislation affecting agriculture, could affect quality, price and supply. We are exposed to the quality of the barley crop each year, and significant failure of a crop would adversely affect our costs. If we fail to attract and retain enough sufficiently trained customer service associates and other personnel to support our operations, our business and results of operations will be seriously harmed. We rely on customer service associates, and our success depends to a significant extent on our ability to attract, hire, train and retain qualified customer service associates. Companies in our industry, including us, experience high employee attrition. Our attrition rate for our customer service associates who remained with us following a 90-day training and orientation period was on average approximately 5% per month. A significant increase in the attrition rate among our customer service associates could decrease our operating efficiency and productivity. Our failure to attract, train and retain customer service associates with the qualifications necessary to fulfill the needs of our existing and future clients would seriously harm our business and results of operations. Our future business, results of operations and financial condition may be adversely affected by reduced availability of our core ingredients. Our ability to ensure a continuing supply of our core ingredients at competitive prices depends on many factors beyond our control, such as the number and size of farms that grow crops, poor harvests, changes in national and world economic conditions and our ability to forecast our ingredient requirements. The several ingredients used in our products are vulnerable to adverse weather conditions and natural disasters, such as floods, droughts, frosts, earthquakes, hurricanes and pestilences. Adverse weather conditions and natural disasters can lower crop yields and reduce crop size and quality, which in turn could reduce the available supply of our core ingredients. If supplies of our core ingredients are reduced or there is greater demand for such ingredients, from us and others, we may not be able to obtain sufficient supply on favorable terms, or at all, which could impact our ability to supply products to distributors and retailers. We may rely on subcontractors and partners to provide customers with a single-source solution or we may serve as a subcontractor to a third party prime contractor. From time to time, we may engage subcontractors, teaming partners or other third parties to provide our customers with a single-source solution for a broader range of service needs. Similarly, we are and may in the future be engaged as a subcontractor to a third party prime contractor. Subcontracting arrangements pose unique risks to us because we do not have control over the customer relationship, and our ability to generate revenue under the subcontract is dependent on the prime contractor, its performance and relationship with the customer and its relationship with us. While we believe that we perform appropriate due diligence on our prime contractors, subcontractors and teaming partners and that we take adequate measures to ensure that they comply with the appropriate laws and regulations, we cannot guarantee that those parties will comply with the terms set forth in their agreements with us (or in the case of a prime contractor, their agreement with the customer), or that they will be reasonable in construing their contractual rights and obligations, always act appropriately in dealing with us or customers, provide adequate service, or remain in compliance with the relevant laws, rules or regulations. We may have disputes with our prime contractors, subcontractors, teaming partners or other third parties arising from the quality and timeliness of work being performed, customer concerns, contractual interpretations or other matters. We may be exposed to liability if we lose or terminate a subcontractor or teaming partner due to a dispute, and subsequently have difficulty engaging an appropriate replacement or otherwise performing their functions in-house, such that we fail to fulfill our contractual obligations to our customer. In the event a prime contract, under which we serve as a subcontractor, is terminated, whether for non-performance by the prime contractor or otherwise, then our subcontract will similarly terminate and we could face contractual liability and the resulting contract loss could adversely affect our business and results of operations. In certain instances, we rely on single or limited service providers and outsourcing vendors nationally because the relationship is advantageous due to quality, price, or lack of alternative sources. If production or service was interrupted and we were not able to find alternate third-party providers, we could experience disruptions in manufacturing and operations including product shortages, higher freight costs and re-engineering costs. If outsourcing services are interrupted or not performed or the performance is poor, this could impact our ability to process, record and report transactions with our customers and other constituents. Such interruptions in the provision of supplies and/or services could result in our inability to meet customer demand, damage our reputation and customer relationships and adversely affect our business. Because we source ingredients from various sources, we rely on various suppliers and their quality control measures. While we have procedures to maintain the highest quality levels in our products, we may be subject to faulty, spoiled or tainted ingredients or components in our products, which would negatively affect our products and our customers’ experience with them and could decrease customer demand for our products. In addition, if there are serious illness or injury due to our products, there can be no assurance that the insurance coverage we maintain is sufficient or will be available in adequate amounts or at a reasonable cost, or that indemnification agreements will provide us with adequate protection. We depend on these suppliers and subcontractors to meet our contractual obligations to our customers and conduct our operations. Our ability to meet our obligations to our customers may be adversely affected if suppliers or subcontractors do not provide the agreed-upon supplies or perform the agreed-upon services in compliance with customer requirements and in a timely and cost-effective manner. Likewise, the quality of our products may be adversely impacted if companies to whom we delegate manufacture of major components or subsystems for our products, or from whom we acquire such items, do not provide raw materials and basic ingredients which meet required specifications and perform to our and our customers’ expectations. Our suppliers may be less likely than us to be able to quickly recover from natural disasters and other events beyond their control and may be subject to additional risks such as financial problems that limit their ability to conduct their operations. The risk of these adverse effects may be greater in circumstances where we rely on only one or two subcontractors or suppliers for a particular raw material or ingredient. We rely, in part, on our third-party manufacturers to maintain the quality of our products. The failure or inability of these manufacturers to comply with the specifications and requirements of our products could result in product recall and could adversely affect our reputation. Our third-party manufacturers are required to maintain the quality of our products and to comply with our product specifications and requirements for certain certifications. Our third-party manufacturers are also required to comply with all federal, state and local laws with respect to food safety. However, our third-party manufacturers may not continue to produce products that are consistent with our standards or that are in compliance with applicable laws, and we cannot guarantee that we will be able to identify instances in which our third-party co-manufacturer fails to comply with our standards or applicable laws. Any such failure, particularly if it is not identified by us, could harm our brand and reputation as well as our customer relationships. We would have these same issues with any new co-manufacturer, and they may be exacerbated due to the newness of the relationship. The failure of any manufacturer to produce products that conform to our standards could materially and adversely affect our reputation in the marketplace and result in product recalls, product liability claims and severe economic loss. As a food production company, all of our products must be compliant with regulations by the Food and Drug Administration (FDA). We must comply with various FDA rules and regulations, including those regarding product manufacturing, food safety, required testing and appropriate labeling of our products. It is possible that regulations by the FDA and its interpretation thereof may change over time. As such, there is a risk that our products could become non-compliant with the FDA’s regulations and any such non-compliance could harm our business. Ingredient and packaging costs are volatile and may rise significantly, which may negatively impact the profitability of our business. We purchase large quantities of raw materials, including ingredients such as almonds, almond flour, sunflower oil, spices, and seasonings. In addition, we purchase and use significant quantities of film, paper, plastic sheeting and corrugate to package our products. In recent periods, the prices of almonds, sunflower oil and fuel have been priced above or below their respective averages and we have realized some exposure to profitability from these price variances in the form of reduced cost of goods sold and resulting higher gross profit margins. Costs of ingredients and packaging are volatile and can fluctuate due to conditions that are difficult to predict, including global competition for resources, weather conditions, natural or man-made disasters, consumer demand and changes in governmental trade and agricultural programs. As such, any material upward movement in raw materials pricing could negatively impact our margins, if we are not able to pass these costs on to our customers, or sales if we are forced to increase our prices, which would adversely affect our business, results of operations and financial condition. Due to the nature of the discount rate of the Security, when forecasting the hypothetical value of their holdings in different liquidity event scenarios, Investors should consider the overall valuation of the Company in addition to their individual return. In a liquidity event in which the value of an Investor’s stake is determined by the discount method (that being situations where applying the Valuation Cap results in a lower return for such Investor), the Investor’s individual return will be the same regardless of the Company’s valuation. As an example, a $1,000-dollar investment in Crowd SAFE units of a hypothetical company with a discount of 20% and a valuation cap of $10 million would result in a $250 return upon a liquidity event in which the company is valued at either $5 million or $10 million. However, Investors should consider that an ownership stake in a higher-valued company is generally preferable to an ownership stake with the same absolute value in a lower-valued company. The higher-valued company will have been assessed by the market to be worth more and will have additional funding with which to pursue its goals and is therefore more likely to produce greater returns to the Investor over the longer term. The Securities will not be freely tradable until one year from the initial purchase date. Although the Securities) may be tradable under federal securities law, state securities regulations may apply and each Purchaser should consult with his or her attorney. You should be aware of the long-term nature of this investment. There is not now and likely will not be a public market for the Securities. Because the Securities have not been registered under the Securities Act or under the securities laws of any state or non-United States jurisdiction, the Securities have transfer restrictions and cannot be resold in the United States except pursuant to Rule 501 of Regulation CF. It is not currently contemplated that registration under the Securities Act or other securities laws will be effected. Limitations on the transfer of the Securities may also adversely affect the price that you might be able to obtain for the Securities in a private sale. Purchasers should be aware of the long-term nature of their investment in the Company. Each Purchaser in this Offering will be required to represent that it is purchasing the Securities for its own account, for investment purposes and not with a view to resale or distribution thereof. Prior to the Offering the Company’s current owners of 20% or more beneficially own up to 98.4% of the Company. Subject to any fiduciary duties owed to our other owners or investors under New York law, these owners may be able to exercise significant influence over matters requiring owner approval, including the election of directors or managers and approval of significant Company transactions, and will have significant control over the Company’s management and policies. Some of these persons may have interests that are different from yours. For example, these owners may support proposals and actions with which you may disagree. The concentration of ownership could delay or prevent a change in control of the Company or otherwise discourage a potential acquirer from attempting to obtain control of the Company, which in turn could reduce the price potential investors are willing to pay for the Company. In addition, these owners could use their voting influence to maintain the Company’s existing management, delay or prevent changes in control of the Company, or support or reject other management and board proposals that are subject to owner approval. Sounds like it will be a good investment. It is hard to find time to go to a Indian grocery store and in places like NYC where parking is a huge concern, it is hard to carry all those heavy bags. This is a huge help for me and I believe there is a great potential in this business. I believe they have created a great service and I expect a number of individuals will latch on to the beauty of their offerings. I invested because I have used Fretch before and liked the service. I invested because I see great potential future in this business. I must expand my portfolio and build my empire. Fretch made life easy for every Indian. Food delivery, fresh ingredients, and creative alternatives that are easily prepared represent the future of meals at home. Fretch can scale good service to customers like me. Love their customer service. Packing and deliver is extremely professional and timely. 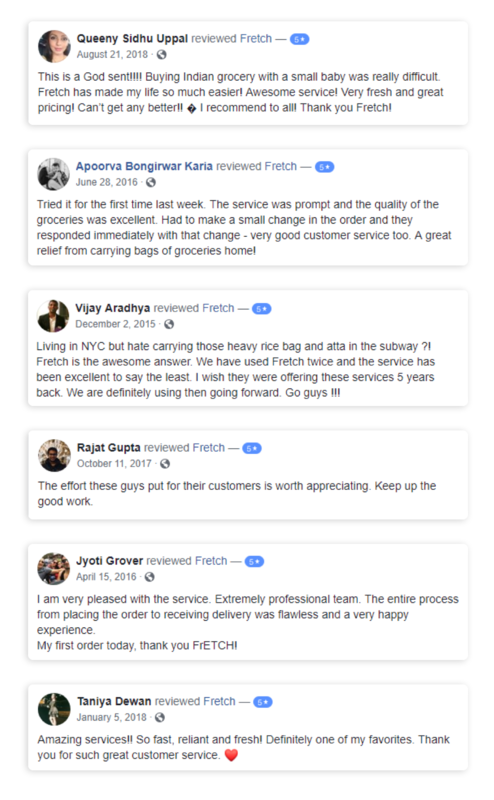 FrETCH is a brilliant initiative from the founders to simplify, and modernise (ethnic) grocery shopping catering to the South East Asian community local to the New York City area.